We absolutely LOVE our kiddos, but every once in a while it's so nice to get away and recharge. This was the PERFECT weekend to do it! Hanging with one of my very favorite people, GREAT food, one of the cutest cities, AND Jesus?? The PERFECT combo! I was horrible at pictures on Friday. I stole this off a new friend's FB page! We met up with some old/new friends and had dinner during our break. Great to meet up and chat with these girls!! They were all so sweet! Saturday I vowed to do WAY better with the pictures! We started the morning off at the conference. Let me just say that it was SO good! It always amazes me at an event like that with over 1,200 women every girl hears exactly what they need to hear. Does that make sense? After the sessions, Shay and I would chat about what we thought or were thinking...we ALWAYS had felt God speak to us in different ways, but it was ALWAYS just what we needed. Love that! And...a conference like this where you hear so many wonderful speakers makes me want to huddle in a corner and read ALL their books! My to-read list is HUGE! Then we hit up downtown Franklin for some cute shopping! I'd heard about this store before but had never been. The store called, "Philanthropy" was amazing! Check out this prayer wall where they encourage customers to write prayer requests or praises! We somehow found our way to this bakery for a DELICIOUS piece of pie. You can't really tell from this picture, but there was a group of girls...maybe sorority girls or high school girls who HAD to be going through some kind of initiation or something? They were dressed like clowns. Shay and I took a pic with the shops in the background and they started screaming, "Selfie"!! hahahaha! This is a little blurry, but we made our way to the mall. My foodie friend is all about Williams Sonoma. I confessed that I'd never bought anything in the store in my entire life. Did you hear that? It's Shay gasping again!! hahahaha!! We had a DELICIOUS dinner and then ended the night at the movie theater. We couldn't remember the last adult movie we'd seen in a theater so it was clearly time! My parents came and stayed with the kiddos because Tab was in Oregon all weekend for football. Can't you tell in this picture they sent me this weekend that my kiddos were TOTALLY missing me? hahaha!! Yeah, right!! They watched a movie, went to the zoo, AND the Rainforest Cafe. I can't even come close to competing with that. Thank you to my parents for taking such GREAT care of my kiddos!! 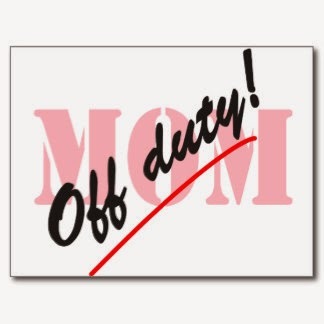 I couldn't have had an "Off-Duty" weekend without you!! Yesterday after Tab and I both got back into town, we took the kiddos swimming. (I couldn't tell my camera was on black and white because it was so bright outside.) The kiddos watched Dolphin Tale this weekend, so they were acting like dolphins. Hope you had a GREAT weekend as well!! You guys...FALL "officially" arrives this week!! Girl! I had THE BEST time at Dot Mom with you!! Love you so much!! Looks like you girls had a blast! And the pic of Bowen as the dolphin trainer is greatness! Yay! Glad you girl's had so much fun!! See you soon!! Sounds like you had a blast! Hope you have a great week ! And happy fall!!!! Yay!!! Glad you had a great time! Hold on to that spiritual high. That picture of Bowen is the best. I think the black & white makes it even better! Weekends away with the bestie are just what a momma needs sometimes! Hope you are refreshed and restored and ready to be an even better mom this week! A weekend getaway sometime is what every momma needs! Looks like y'all had a great time. I must tell you that the Willimas Sonoma store here in Texas is really good and its hard trying to figure out what to buy because you just want it all-ha!! It was so fun to get to meet you. So glad y'all had such a fun time! Looks like you had a great time - dotMOM seems like a great conference! I'm glad you had a good time in Nashville and Franklin (that's where I live)! All moms need time to recharge. 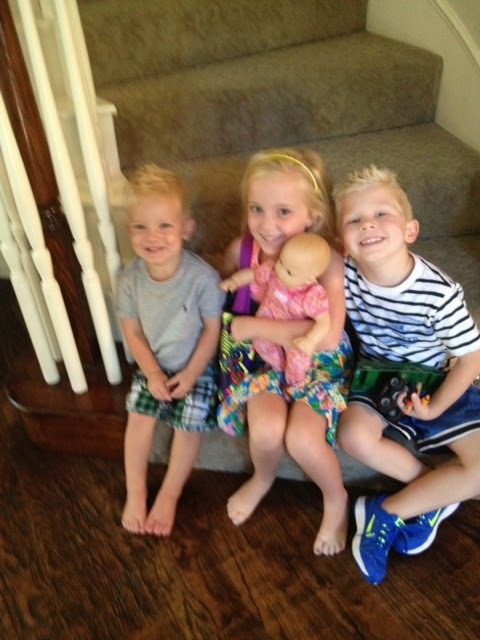 Those kiddos are precious. I know they were happy to see you.